The USDC is a non profit, 100 percent volunteer organization that is dedicated to growing the market share of dollars spent by large companies and other government agencies on smaller business in Utah. 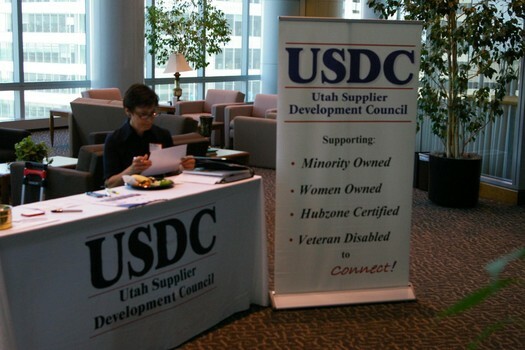 USDC helps these big companies see services and showcase the products that are offered by disadvantaged businesses including minority owned, women owned, HubZone and Service Disabled Veteran owned small companies. So, can you spot Lance in the USDC Newsletter below–? Companies from Utah and the surrounding region showed up to either show what they can offer companies, or like we did, show off what we can do to help companies grow. Well, see if you can spot Lance in their newsletter, doing what he does best–offering JMH solutions to any warehouse shelving, locker or other warehouse need these large companies need help in solving. And believe us, we find that companies truly need ideas to save space, ensure safety and efficiency and that is why we are always available to give answers to your questions, and aid you in making your company operate better. So if your company has a unique storage problem that a metal locker or pallet racking may solve, or you are thinking about the confusing layout of your current warehouse, then why wait for next year’s USDC Vendor Fair? We invite you to call Lance up and let him do what he does best and that is helping solve your problem with JMH’s resources and innovative ideas.